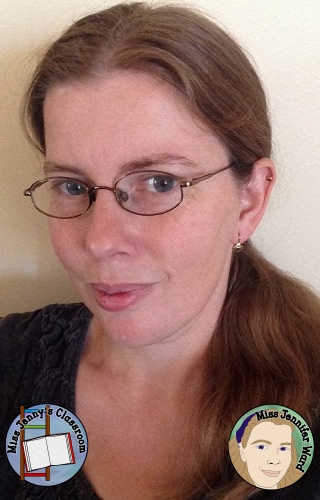 I've finally gotten around to adding to my post last year about digital clocks. 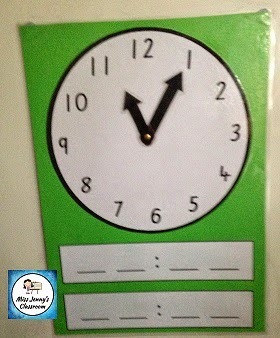 Telling the time is such a fun time for students but it is also important that they learn this life-long skill. We use time in our everyday lives to tell us when to get up, when to be at appointments and when to meet for a party! I found that when I had a composite 1/2 class a couple of years ago they could not tell basic time, let alone anything more complicated. 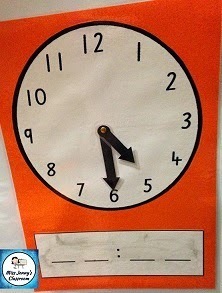 To be honest when they were asked to draw a clock - let's just say that some didn't even know what numbers should be on it. My first clock was a very basic clock (no minute marks) mounted onto orange cardboard and underneath it was space to write the time in digital. It was a good for the students to count by 5s and to learn the basics of o'clock, half past, quarter past and quarter to. The digital aspect allowed me to add some differentiation to the students who picked this up quickly. To move my students on (didn't want them getting bored - we did practice this every day!) I created a second clock on green cardboard. It also had two digital clock boxes to allow students to begin to understand the connection between analogue, 12- and 24-hour time. I honestly wasn't sure what to put this clock under. It was the final clock I made and this time it was on purple cardboard. It featured a clock with minute markings plus the 12- and 24-hour digital time boxes. It was by far the most popular clock - I think they felt a sense of achievement reaching it. This month though I have been going through and updating my resources. It's those little things you think of after you have used what you made. I made some digital numbers that can be attached via Blu-Tac to make for easy changes - though you could use Velcro if needed but it would make for bulkier storage. 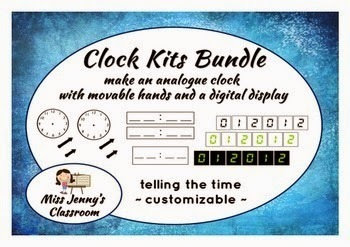 I sell all these kits individually on TPT but if you are interested I recommend the bundle - you save money and get all the clocks!